John Mino, a sophomore transfer from Villanova, has earned the starting goalkeeping role for the men's soccer team with his strong work ethic. In youth sports, the goalkeeper’s position is often overlooked. The goalie usually sits crisscross in the net, picks dandelions and waves to videotaping parents in the stands, unsure what to do if the ball actually makes it to them. Once athletes reach their formative years, the goalkeeper role is more crucial for the success of a team. Goalkeepers are the last line of defense for a team, requiring agility, speed, reflexes, leadership and concentration. Maura Jacobs, Ryleigh Brown and John Mino are the starting goalkeepers for AU’s fall sports teams and have all taken different roads that have led them to AU. Field hockey junior Maura Jacobs only started playing field hockey in the seventh grade with her sights set on being a field player. After a coach approached Jacobs and her parents following her first tryout, she’s stayed in the circle ever since. Jacobs captured Patriot League Goalkeeper of the Week on Sept. 11, coming a long way from her humble beginnings only eight years ago. During her first game as an Eagle, Jennings put Jacobs in the net for the last 10 minutes when someone immediately scored on her. Jennings benched her right after. Yet, she grew to become AU’s primary netminder, playing goalkeeper when the Eagles won their 10th Patriot League championship in 2016. Jacob vividly remembers one save in the final round of the Patriot League championships against Boston University last season. After a rebound in front of the cage, the ball popped up in the air, and one of BU’s attackers “baseball hit” the ball toward the net, Jacobs said. Somehow, Jacobs got a touch on the ball with her stick to get it out and over the N line. Jacobs’ family plays a huge role in her collegiate success, she said. Her parents can often be found on the sidelines of both home and away games, as they did for her brother during his time as a college athlete. Of course, goalkeepers don’t save every ball that comes their way, but that’s part of the game. Field hockey head coach Steve Jennings picked Jacobs to come onto the AU team not only for her skillset, but also for her attitude. Ryleigh Brown has been in cleats since she was three years old, and she’s been a soccer goalkeeper since age 13. Brown, a freshman, has only been at AU a short few months, but her time in the net has taught her enough to last her for her next three seasons, she said. Her favorite moments this season have been coming out of the net and rising above attacking players to claim crosses from the opposing team. Women’s soccer head coach Anabel Hering thinks that Brown has a long way to go when it comes to being vocal on the team, and that Brown is afraid to speak up out of fear that she’ll step on the upperclassmen’s toes. Hering thinks that Brown’s greatest strength is claiming services in the box and her fearlessness. Both Brown and Hering agree that she needs to improve her training habits to improve her game for herself and for her team. Over of the course of her next three years, Hering is sure that Brown will establish herself as the Eagles’ goalkeeper. “She is coachable and a quick learner, which makes the training process easier,” Hering said. Another new face on the field for the Eagles belongs to sophomore John Mino, the goalkeeper for the men’s soccer team. Mino transferred from Villanova and is in his first year with AU. While he didn’t play in AU’s first game of the season, Mino made his Eagle debut in relief against Georgetown Aug. 25 and has starred as AU’s primary goalkeeper since. Mino has been playing soccer since he was seven years old, but he was asked to become a goalkeeper because of his height. His high school team didn’t make it to state his junior and senior years, but he said the lessons he learned helped make him a leader on the team and prepared him for college athletics. Mino looks up to New England Patriots’ quarterback Tom Brady, inspired by his work ethic and commitment to his team. “I'm not the tallest kid or the fastest kid, and I'm certainly not the strongest kid, but the only way kids like that are going to be able to play is to work hard,” Mino said. Head coach Todd West thinks that Mino plays well off his line and behind the back four, but believes the redshirt freshman has room to improve if wants to establish himself as AU’s number one keeper. 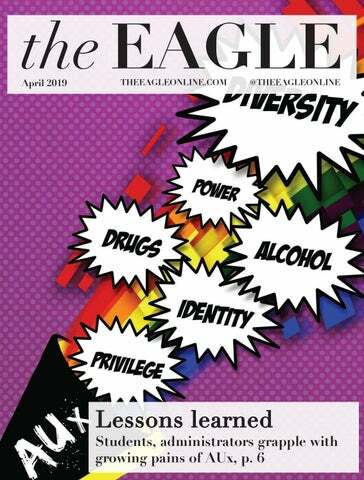 This story was originally published in the Oct. 20 print edition of The Eagle.